USTER® SENTINEL is much more than an end-break detection system. It is a comprehensive solution for ring spinning optimization, with benefits in quality, productivity and efficiency. Data can now be integrated with the Total Testing Center through USTER® TESTER 6, giving spinners an overview of quality through all process steps in the mill, for focused control of production management. Adding USTER® ROVING STOP enhances the economic advantages still further, reducing waste by stopping the roving feed immediately an end-break is detected. Using USTER® SENTINEL with USTER® ROVING STOP improves productivity and cuts down the risk of quality problems in ring spinning. Potential quality claims are avoided, since waste material and uncontrolled fiber – which could affect neighboring spindles and the entire machine – are greatly reduced by the USTER® ROVING STOP. Overload on rollers is also prevented, ensuring higher productivity through reduced lapping. These benefits together can be expected to extend the service life of spinning components such as aprons, cots and cylinders by around 20%. 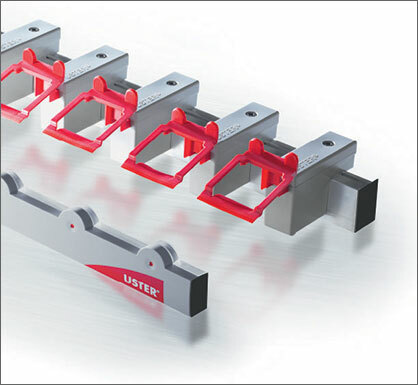 The design of USTER® ROVING STOP is striking. Its streamlined and uncluttered profile is geared to optimum machine performance. The unique compact shape leaves operators clear access, saving time and speeding up responses. And its smart design enables the USTER® ROVING STOP to implement a rapid and complete separation of the process, to avoid raw material waste. The advantages of USTER® SENTINEL go far beyond end-break detection: it brings a completely new approach to quality, productivity and efficiency in ring spinning. Bobbin build-up information and end-break detection are the basic functions, but total optimization is the result. The intuitive reports on bobbin build-up include every parameter influencing end-breaks. Clear visuals point to exact reasons for breaks, making optimization easy. Mills benefit from improvements in ambient conditions, service life of mechanical components – and machine speed. Machine performance is displayed in real-time, giving a fast overview of the most relevant production and laboratory data – as well as the machine’s energy consumption. The well-established expert system supports mills with clear guidance to profitable optimization. Higher yield and fewer quality issues also result from reduced repair times. Badly-performing spindles are reliably identified and the USTER® SENTINEL guides machine operators quickly to spindle breaks, through clear and simple indications. Other issues which often impair the spinning process – such as idle, rogue and off-quality spindles, as well as spindle slip – are all monitored for fast response. USTER’s ring spinning optimization system maximizes profitability where it matters most. USTER® SENTINEL measures and controls the most expensive process in yarn manufacturing. It monitors the productivity of all spindles, as well as providing the required links and information to help the spinning mill optimize both machine performance and the entire process. Connecting USTER® SENTINEL to the Total Testing Center of the USTER® TESTER 6 opens the way to extended analysis, based on centralized quality data from all spinning processes. This is the route to management of a spinning mill with quality in mind. Adding USTER® SENTINEL data to this creates the ultimate quality optimization package. This is a significant further development milestone, supporting spinners to achieve the ultimate goal of excellence in quality and profitability.